Basketball Decision Training (BDT) is a cutting-edge player development program that combines skills and mind training. Players practice in a game-like environment which improves their skill retention and transfers to confidence and better game performance. The DVDs cover critical skills including shooting, ball handling, footwork and more. Coach Oliver shows how to apply these in both 1-on-1 and 3-on-3 situations. Zero-seconds training complements BDT. It teaches players how to quickly and decisively execute offensive play with no pause on the catch. As soon as a player's feet hit the ground, they are immediately into their shot, pass, or drive. The unique, fun approach in these DVDs mixes various drills to challenge players' skills, adding layers to training so that they never practice in their comfort zone. Coach Oliver also covers 15 unique shooting drills in the Dynamic Form Shooting section. These progressions replicate the training habits of NBA stars Jimmy Butler and Dirk Nowitzki. In this chapter, Coach Oliver introduces his unique player development system. It features randomized practices, a games-based approach, zero-seconds concept, and basketball decision training. He will apply it to shooting, ball pick-up, footwork, and competitive 1-1 and 3-on-3 situations. Since it's endlessly variable, players will never practice in their comfort zone. In this chapter, Coach Oliver goes into more depth on "fight for your feet." He explains the 1-2-3 shooting positions and how this consistent technique improves your shooting percentages. In this chapter, you'll learn offensive skills in drills and combinations. Coach Oliver emphasizes that there is one threat, not a triple threat. If you're open, shoot the ball. If not, get the ball to the ground and figure it out. He also introduces a new, more effective, approach to ball rips. In this chapter, you'll learn about Basketball Decision Training (BDT) in detail. You'll practice skills and make decisions simultaneously - just like you would in a game. This helps with retention and will transfer to your game performance. In this chapter, you'll learn 15 dynamic movement shooting drills. You learn how to add one-foot jumps and other dynamic movements to a traditional form shot. This will help you improve your balance, coordination, and core stability. Better balance and stability during shots leads to a higher shooting percentage. You'll also learn the characteristics of great shooters and how you can achieve them. In this chapter, you'll learn how to use and sequence drills, get tips for building your workout, and learn how to create your own mixed drills. In this chapter, Coach Oliver combines 0-second skills and drills in a 1-on-1 environment. It includes 5 different drills with dozens of variations. You also learn decision cues and teaching commands to add complexity to the workout. Competitive 3-on-3 drills allow players to compete in a live setting and further enhance the fundamental skills and decision training concepts. Coach Oliver gives you a variety of constraints to emphasize skills in 3-on-3 drills and competitive situations. Coach Oliver goes into more detail about his coaching philosophy, why it works, and why coaches and players love it. I have already incorporated so many of the BDT teachings into my skill development work. Talk about 'athlete satisfaction', each one of the players I implemented the BDT concepts with loved the drills. They are engaged and focused throughout the work. They also feel a sense of accomplishment through a very limited number of shots so the work can be very efficient. I have respected Chris Oliver via his online sharing of important basketball concepts. But I was blown away by the rationale and evidence supporting his Basketball Decision Training. I am looking forward to diving into a much more detailed understanding of Chris' approach. As coaches, we talk about decision making, but do very little to train it. Chris Oliver has an impressive and insightful way to see the game and the only thing better than his ability to see it is his ability to teach it to others. He's increasing his reach to others all the time and we are all better for it. He's taking a player's proactive approach to another level. Chris Oliver has coached basketball for more than 20 years. 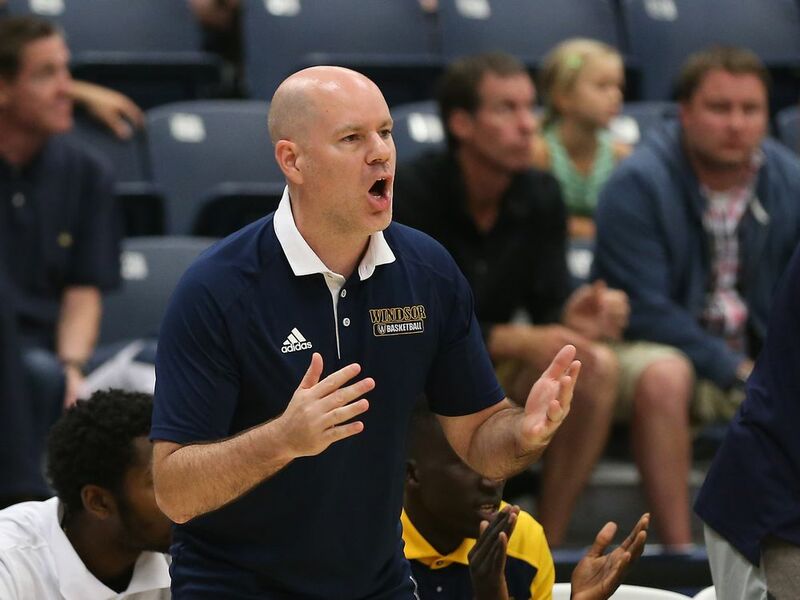 He's been the Head Men's Basketball Coach at the University of Windsor since 2005. A three-time OUA (Ontario University Athletics) Men's Basketball Coach of the Year, he has chalked up an impressive 168-69 record in conference play and has captured six OUA West regular season titles, two OUA West playoff titles, a Wilson Cup Ontario Championship, and earned three berths to the CIS (Canadian Interuniversity Sports) National Championships. Twelve of his former players continued their careers at the professional level in leagues around the world. His Windsor teams have beaten four NCAA Division-I teams while competing against programs like the University of Kentucky, Ohio State University, and Virginia Tech University. Coach Oliver has been honored with numerous coaching awards including the Fox 40 OUA Coach of the Year Award, the OUA Men's Basketball Coach of the Year Award, and the Gino Fracas Award as the University of Windsor Coach of the Year. Coach Oliver helps coaches improve player development, transfer from practice to games, and decision-making. He is passionate about sharing the game and stimulating the development of coaches around the world. Prior to arriving in Windsor, Coach Oliver served as the head coach at Queen's University and an assistant coach at McMaster University and the University of Victoria. Prior to coaching at the university level, he won an OFSAA Provincial Championship at Hamilton St. Mary's and coached boys and girls teams at the high school, club, provincial, and AAU levels. Coach Oliver graduated with a Bachelor of Kinesiology from McMaster University, a Bachelor of Education degree from Brock University, and a Master's in Physical Education and Coaching Studies from the University of Victoria. He is also an NCCP Level Four coach. Who Should Consider this eBook & DVD Set? Basketball Decision Training (BDT) is based on a combination of skills and mind training. It can be easily adapted to various ages and skill levels, from middle school through college. The unique drills incorporate variable training which simulates actual game play - skills aren't practiced in isolation. This boosts players' confidence and makes training more fun for players and coaches. In addition to receiving the DVDs, you get immediate access to the eBooks and streaming videos. The price for the 2 DVDs and 61 page eBook is $79. If for any reason, your purchase is not what you expected, just send us a message and we’ll give you a full refund. No questions asked. Not up to the same quality of other videos I've ordered from Breakthrough. The Decision Training title was deceptive. Not a great deal of situations covered and the decisions covered were quite obvious. Cannot recommend this video.